The debate over the first video game is often framed as being between Willy Higinbotham's Tennis for Two (1958), Spacewar! (1961) or Pong (1972), but the graphics based computer game OXO (aka Noughts and Crosses) predates them all. Why does OXO so often get overlooked? Because when it was first created in 1952, it was only shown to the staff and students of Cambridge University. Platform: Electronic Delay Storage Automatic Calculator (EDSAC). Historic Significance: The first graphics-based computer & video game. In 1952, University of Cambridge student Alexander Sandy Douglas was working towards earning his Ph.D. His thesis focused on human-computer interactions and he needed an example to prove his theories. At that time Cambridge was home to the very first stored-program computer, the Electronic Delay Storage Automatic Calculator (EDSAC). This gave Douglas the perfect opportunity to prove his findings by programming the code for a simple game where a player can compete against the computer. The actual program for the game was read off of Punched Tape (aka Input Tape), a strip of paper with numerous holes punched into it. The placement and number of holes would be read as code by the EDSAC, and translated onto an oscilloscope's cathode-ray tube readout display as an interactive game. 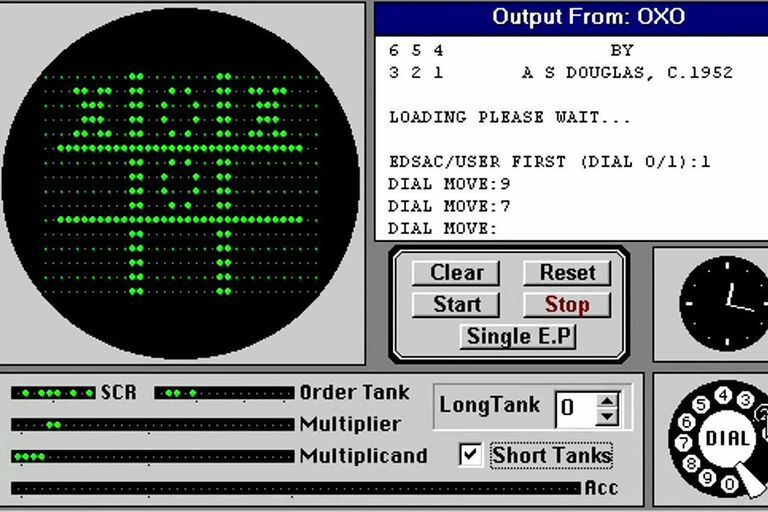 Douglas' project was a success and became the very first video game and graphical computer game, but it was also one of the very first (albeit primitive) applications of true artificial intelligence. The computer's moves in reaction to the player move were not random or pre-determined but entirely made at the computer's discretion. OXO is often overlooked for its accomplishments in artificial intelligence as the study of AI didn't become a valid science until 1958 when scientist John McCarthy coined the term. OXO is an electronic version of Tic-Tac-Toe (called Noughts and Crosses in the UK). Similar to the first electronic game, the Cathode-Ray Tube Amusement Device (1947), OXO's graphics were displayed on a Cathode-Ray Tube connected to the EDSAC computer. The graphics consisted of large dots forming the cross hatches of the playing field as well as the "O" and "X" player graphics. The game pitted the player against the computer with the player as the "X" and the EDSAC as the "O". Moves were made by the player selecting which square to occupy with an "X" by dialing its corresponding number via the EDSAC's telephone dial. The telephone dial was used as a keyboard to input numbers and direction into the computer. Alexander Sandy Douglas' thesis was a success, earning him his Ph.D. and starting his career in science, however, he would never again program another video or computer game. Although OXO was the very first video/computer game, it was almost completely overlooked at the time. There was only one EDSAC computer in existence, which was housed at the University of Cambridge and never made accessible to the public. The code for OXO was retained as a tech demo for the EDSAC's capabilities.